If it is his privilege to be independent, it is equally his duty to be inter-dependent. All children have to deal with and understand the paradox of separateness and connection, of individuality and belonging. In utero, babies have no sense of separation. They are physically connected to Mom through the very liquid they breathe and the cord through which they receive their food. For most children, the birth process will be the biggest stress of their young lives. They discover that they are separate beings but need their attachment to their parents in order to survive. Do you remember in the first few months of your child’s life when he was fascinated with his hands? He was grappling with his individuality and separation. Then, when children enter their first playgroups or preschool, we encourage them to share, to cooperate and to take turns with other children. They have spent most of their time as infants and toddlers figuring out their individuality only to find that they are supposed to connect to others and that there are rules (sometimes confusing since they change in various environments) that govern that involvement. Earlier this week, I watched as my own preschooler whisked one friend off by the arm and turned to scowl at his other friends, a group he has developed friendships with throughout the school year. I pulled him aside and encouraged him to be kinder to his friends and he did so as I left the classroom. But by the end of the school day, two excluded boys were angry and hurt and the teachers had been informed. E, my son, felt bad too. And so the seeds of inclusion and exclusion are planted early. Our instincts as children may not guide us well. E, my son, was acting on the great excitement he felt from a playdate at his friend’s house playing with new toys and having new play experiences. This enchantment guided him to single out his friend neglecting the others who were regular playmates. So what’s a caring adult to do? The book Habits of Goodness; Case Studies in the Social Curriculum[i] by Ruth Charney tells the story of a preschool teacher with a roomful of children who were also struggling with being kind to one another. She decided to reflect on what she does to encourage genuine respect while recognizing that everyone is not going to be liked equally by everyone else. She planned to model the desired behaviors and keep communication about this topic open through regular class meetings. She also decided to create the “You can’t say you can’t play.” rule to ensure that all students are welcome and included in all play. A rule like this might not work in fifth grade, for example, but in preschool, as children are learning about rules, it worked. In the fifth grade, teachers could, in addition to regular discussions about inclusion and exclusion, explore deeper topics like what it means to be an upstander, the courageous person that stands up for a child who is being bullied. In this case, this teacher decided that the needs of the classroom community were more powerful than the needs of the individual. She set a core standard and value for her classroom that kindness is a requirement which is a standard any home or classroom community could set and cultivate. One essential question in these examples that is raised is – how do we help our children internalize the values that underlie decisions about their actions? It was easy for me to say “Be kind to your friends.” but if my child continues to exclude others when I leave the room, then he has clearly not internalized the value of kindness and inclusion. The stakes only become higher as children grow older. Studies have consistently found that a student’s sense of belonging at school contributes to greater motivation, stronger engagement in classroom activities and higher academic achievement overall. [ii] And as you might suspect, research has demonstrated the converse to be true. Students who do not feel a social connection or sense of belonging are chronically absent, disengaged and low performing. Add to the mix children’s increasing awareness as they mature of racial, ethnic, gender, learning and appearance differences and whole groups of students can become marginalized. 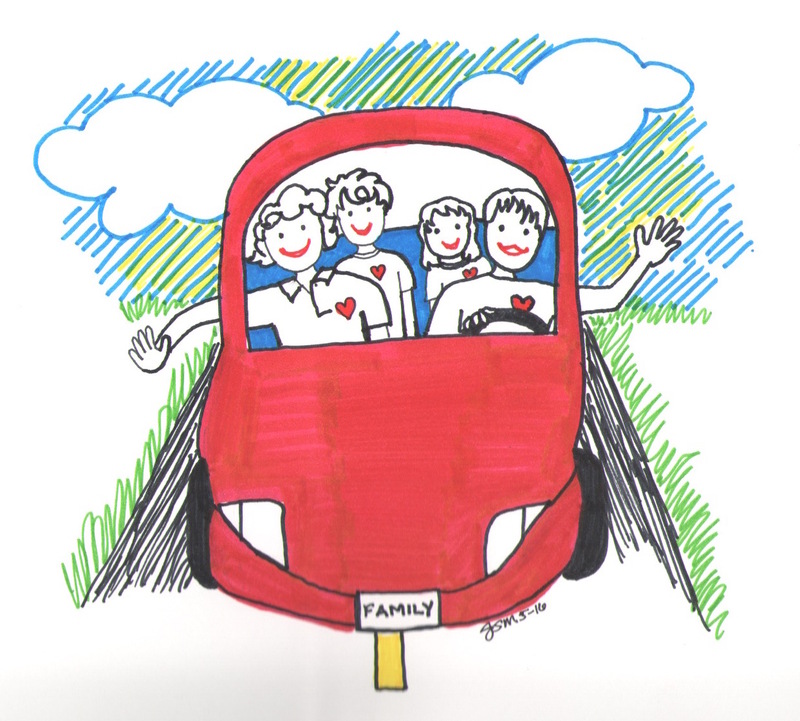 In examining how teachers have best been able to address this issue and ensure that students are truly learning the value of connectedness and inclusion, there are some common themes that can be practiced at home. Create a Culture of Acceptance and Caring – Take a moment to examine your own approach to others. Are you accepting of family members? Neighbors? Colleagues? Friends? Do your conversations with your spouse include statements of understanding, compassion and empathy for those who are different or even who may challenge you? 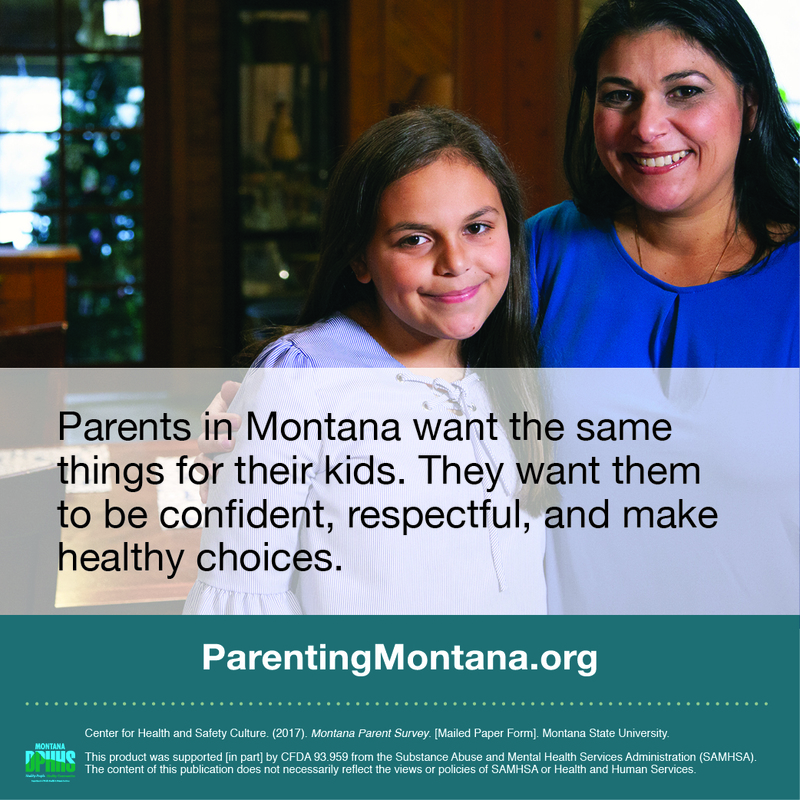 Whether you believe your child is listening or not, the perceptions of you and your partner are internalized by your child and become your family’s culture. Taking some time to reflect on your own values and how you communicate interpersonal problems among family members can set the tone for how your child deals with the outside world. Put yourself to the test. Notice when you are making judgements about another. Stop yourself and ask, “What can I learn from this person who is challenging me?” Reframe your discussion in terms of your own learning with self-awareness. 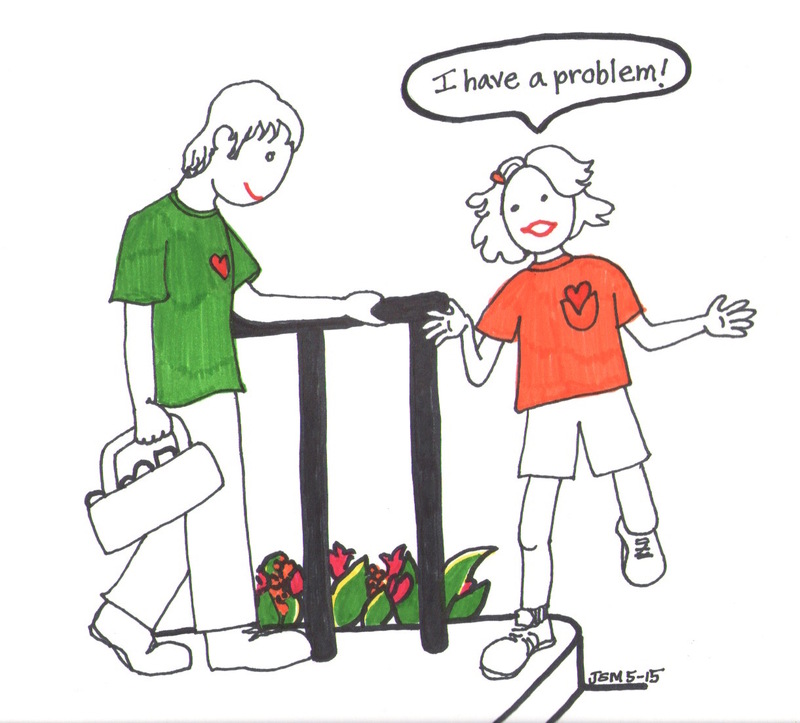 Use the Language of Acceptance and Caring – Young children particularly have a difficult time making distinctions between a person and their actions and choices. A child is tempted to say “I don’t like Billy.” when Billy takes her toy. Instead help her rephrase and reframe her thoughts to say “I don’t like that Billy took my toy.” Every child makes poor choices but each child can feel like they still belong in a family, classroom or friendship circle. Encourage Cross-Age Kindness and Connection – Whether you have siblings or neighbors of various ages, there is an opportunity to create relationships with children who are different – going through different developmental milestones and experiencing different friendships and curricula during the school day. This becomes great practice for acceptance and inclusion. Do not allow children in a neighborhood group to be marginalized. Encourage your child to be the one to reach out and include a child who is being left out. With siblings, encourage older siblings to care for younger ones and involve them in play at the level they are able. Discuss What it Means to be a Good Friend – What it means to be a friend and what it means to be a part of a classroom community can be a regular topic for conversation to revisit as your child grows and changes. What does it mean to you to be a good friend? How do you feel when you are excluded? 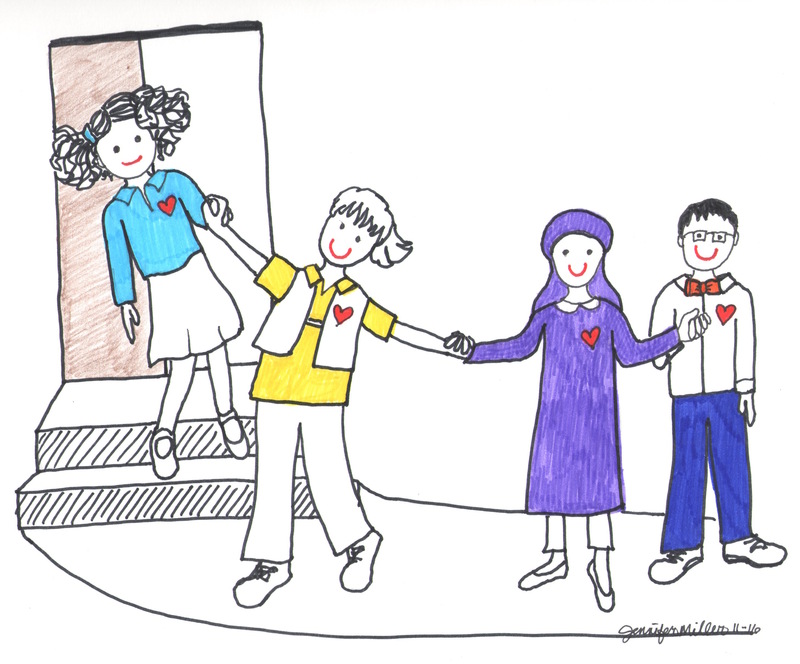 How can you make new children in your school or neighborhood feel welcome? 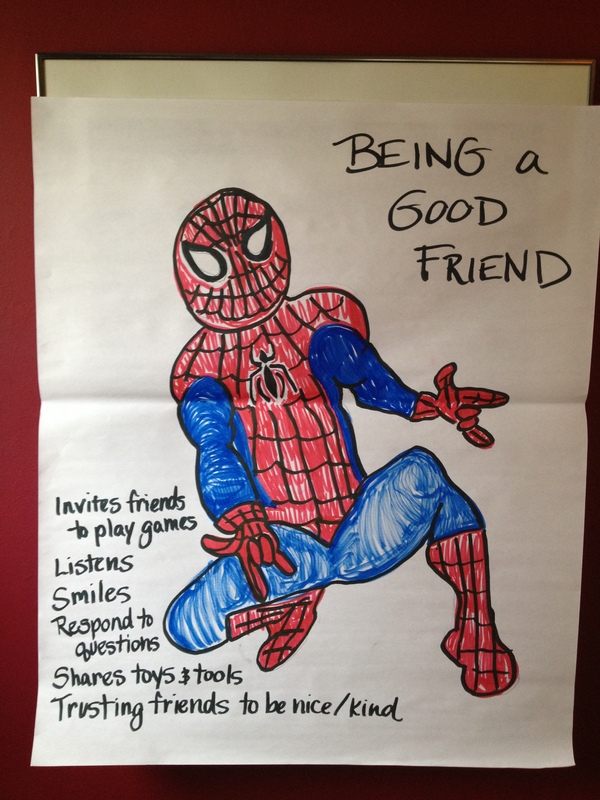 E has a new interest in Spiderman and luckily Spidey’s motto is a relevant one, “With great power comes great responsibility.” [iii] We talked about how he has an opportunity to act like Spiderman in his classroom and be kind to all kids who want to play with him. It’s easy to tell children what not to do (and important in establishing boundaries) but it’s equally important to think through with them what they can and should do instead. 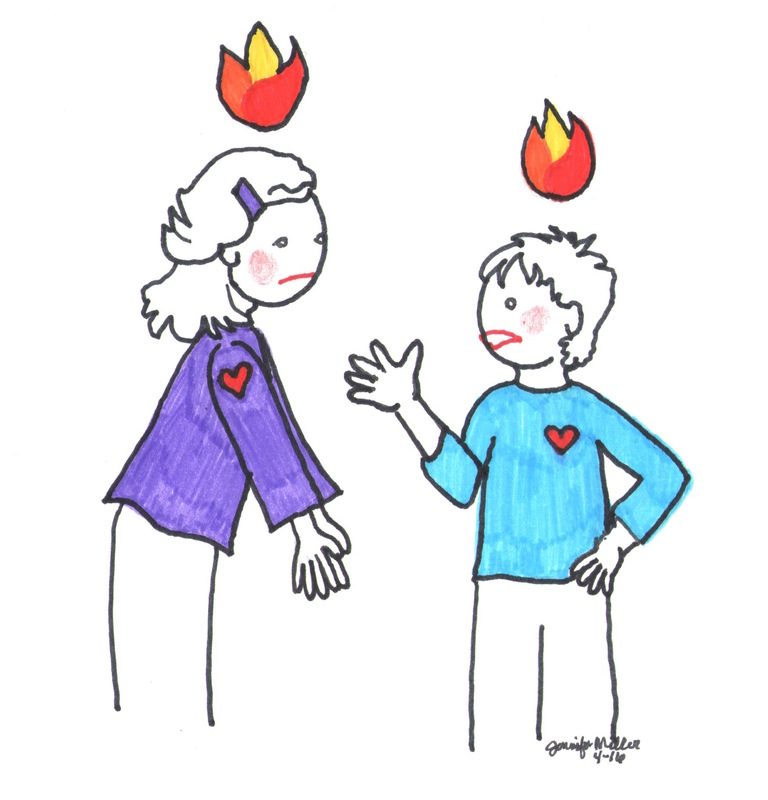 Find and Articulate Common Ground – When your child comes home from school talking about another child’s differences, be sure you explore their common ground too. You might ask, “What are some of her interests? What does she like to play on the playground?” See if you can identify commonalities even as basic as, “She lives in our neighborhood.” or “She loves dogs too.” Focus on differences and children will see their separateness. But help children find common ground, and they will see how they relate to others who are different from them. Notice Kindness – The teacher in the earlier example assigned partners to each student and asked them to notice when their partner was sharing or taking turns. At the end of the day, they would write out certificates for each student whose kindness was noticed. The simple certificate read, “I notice Karen shared today. Signed, Billy Goodman.” They worked on it until all students were receiving a certificate. For families, use a weekly family dinnertime to discuss what acts of kindness you witnessed other family members enacting throughout that week. Create a routine out of your noticing. 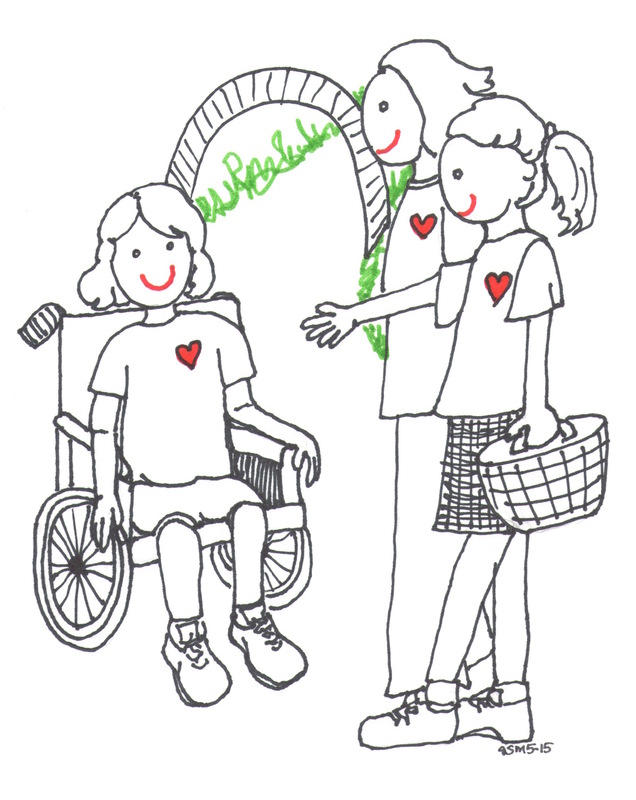 Point out kindnesses when you see them and ask your children to do the same. Use “I notice” language to model observation of other people. Consider that most children at one point or another will feel left out, excluded from the group or even bullied. Those children who are consistently left out are the ones most likely to act as bullies in the future. So even if your child tends to have many friends and not have problems with exclusion, those excluded can still impact your child’s life directly. It’s a sobering thought to realize that the students who committed the school shootings in Newtown, Connecticut, Columbine, Colorado and other places were consistently marginalized. Promoting connectedness in the school and home community is critical now in keeping children safe. Don’t wait until your child has a problem. Begin now to encourage the values of inclusion and kindness in your family life so that your child internalizes and acts on that value. [i] Charney, R. (1997). 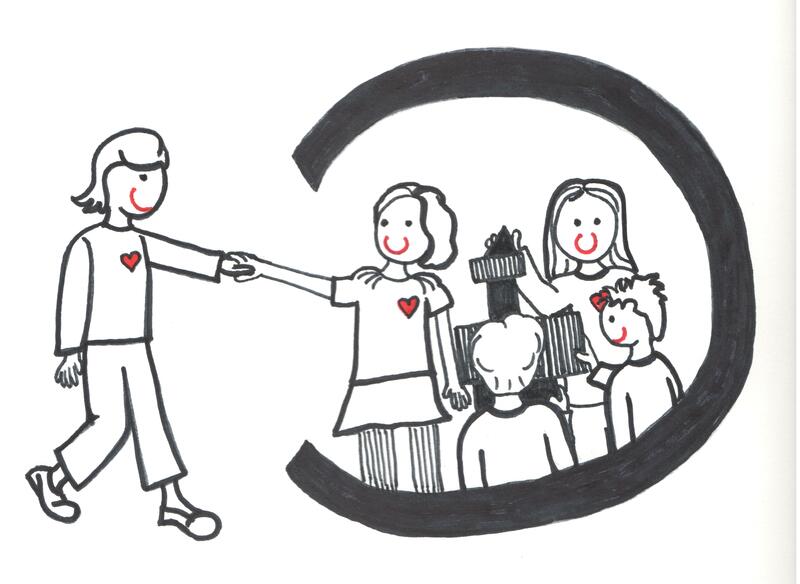 Habits of goodness; Case studies in the social curriculum. Turners Falls, MA: Northeast Foundation for Children. [ii] Osterman, K.F. (2000). Students’ need for belonging in the school community. Review of Educational Research, 70, 323-267. [iii] Lee, S., Kirby, J., & Ditko, S. (1963). Amazing Spider-man. NY, NY: Marvel Comics, Marvel Tales # 138. 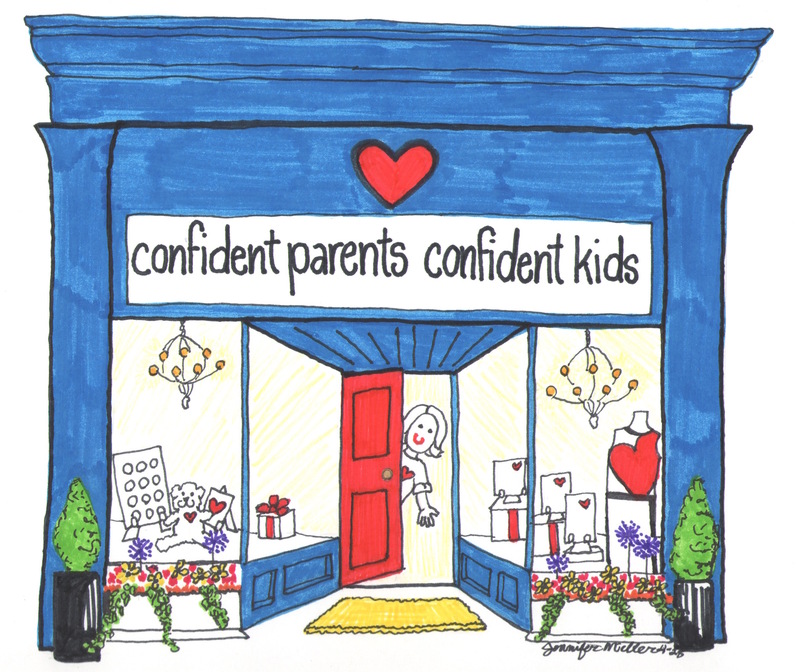 Updated from originally published version on Confident Parents, Confident Kids on March 28, 2013. Thanks for sharing! GREAT to be connected!